An early morning start for our flight to Mandalay. An exotic name very familiar to the British, Mandalay lives up to its reputation. 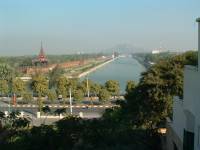 A lovely city with the magnificent Mandalay Fort at the centre circled & protected by a wide moat. The only drawback is the impressive newly-built airport is about an hours drive from the city. 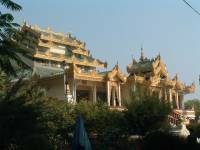 Our guide in Mandalay, Mr. Kyaw, suggested a visit to Mahamuni Paya on route. A big Mahamuni Buddha image is at the centre of this shrine. Many local people come to worship here. Women are not allowed to go up to the shrine & touch the Buddha image & so many female worshippers sit in front of the shrine & pray. The male worshippers are allowed to go up to the shrine & put gold leaf onto the Buddha image & pray up there. Our guide took us up there but first we had to wear the traditional Burmese male longyi that covers our exposed lower. It is a very enchanting experience. We also visited marble & bronze making factories, but the most interesting of all is the gold leaf factory. It is difficult to believe the hard labour involved in processing gold into the leaf that many local people buy to put onto the Buddha image. The whole process from beginning to end is done through intensive labour by young men & women over many hours of the days & weeks in the workshop. As our car drove into the city centre an impressive view of the Fort wall dominated our first impressions of Mandalay. We checked in at the 3* Mandalay Swan hotel. Swan hotel, like the 5* Sedona hotel next door, has the best location facing the imposing fort across the road. The Swan hotel has the most friendly & helpful staffs that I have met in all the hotels in Myanmar. They have a very good swimming pool for a 3* hotel. We are going to offer Swan as our standard hotel & Sedona hotel as our deluxe hotel in Mandalay, with the Mandalay Hill Resort as our Superior hotel. After lunch at the local Thai restaurant we began our tour from the Mandalay Fort's Palace grounds. The once-glorious Royal Palace is now a re-construction of empty concrete buildings & temples after the original palace buildings were destroyed by fire after fierce lightning in 1945. It is still worth wandering in to see though. The 33m high watch tower has best view to see the entire compound. The only surviving building from the original Mandalay Fort is now at Shwenandaw Kyaung monastery. 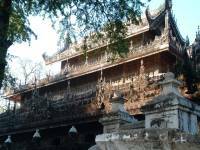 The Burmese wooden building was once part of the Palace complex & was used as an apartment for King Mindon & his chief wife. After King Mindon died, King Thibaw Min had the building dismantled & reassembled on its present site in 1880 as a monastery. Many original carvings are still remaining on the doors & roofs & now I can feel what it looked like in those years ago. We also visited Atumashi Kyaung, Sandamani Paya & Kuthodaw Paya. Visually the Kuthodaw Paya is the most interesting with hundreds of small white stupas housing the 729 marble slabs that are inscribed with the entire Tripitaka. The Paya has been called the world biggest book. We went up Mandalay Hill for the sunset like everyone else. From here you have a fantastic view over the city of Mandalay & the countryside. You can also see the scale of the palace grounds from the benefit of such a high, distant view. Tonight's buffet dinner at the Swan hotel terrace restaurant was accompanied by puppet show & culture song & dance. The food was excellent with choice of local cuisine to Chinese & Mongolian dishes. I particularly like the cold seafood salad with touch of spicy hotness, the stir-fry noodle Chinese style & the freshly-made pancakes for desert. 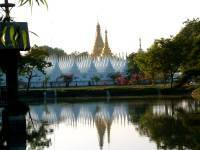 I regard the next day & our second day in Mandalay as the most memorable tour day in Myanmar. 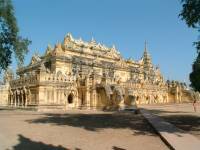 We started the day driving to the south of Mandalay, to Amarapura, to visit the Maha Ganayon Kyaung. This enormous monastery is home to thousands of monks from the young age of 7-8 to the older generation. As we walked around the place the daily life of the monks began to be revealed in its honesty & purity. We saw monks reading, praying, resting, walking, working & bathing. The biggest attraction of the day is at 11am when the monks are gathering for lunch. Although there was quite a few tourists like us, the whole proceeding was very powerful. That day was extra special because a family from outside the area had come to donate rice & food for the monks. In the courtyard in front of the eating rooms for the monks, the whole family, 10 members or more, had several enormous bowls filled with rice & soup to be given to the monks as they entered the courtyard one by one. As the bell struck 11am, silence fell everywhere. A long path leading to the courtyard on the left was being cleared & minutes later a line of red began moving along the path. The first group of monks arrived, walking in line one after another in a disciplined way. They were followed by hundreds & hundreds of others arriving for the next half hour or so. Silently they entered the courtyard walking in a line in front of the family donating the food. One by one the monks opened their food bowls & the family helpers put in one big bowl of rice each & a bowl of soup. They bowed & politely walked into the eating rooms. The scene was very spiritual & touching particularly when the young monks arrived for their food at the very end. Looking at them happily & quietly eating their simple food I walked away thinking how the monks show us their principles of respect, simplicity & discipline. With this thought lingering in my head we carried on our tour to the ancient city of Inwa. To get to Inwa we crossed the Myittha River by boat. Upon arriving at the other side we got into one of the many horse carts that await the visitors by the pier. The ride on the horse cart for the next hour through beautiful countryside of rice fields on the dusty & bumpy dirt track was most pleasurable. There were farmers working on the fields, some tilling the soil with the water buffalo & with their bare hands. 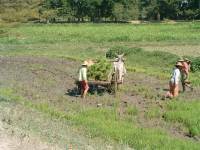 It is lovely to see the old methods of farming still in use in Myanmar. The horse was very keen to keep on riding for us but we stopped at several places of interest including Bagaya Kyaung, Maha Aungmye Bonzan & Nanmyin. For lunch we crossed the river again & drove back to Amarapura & had lunch at Amarapura restaurant with view of the river. The food was nice & the restaurant is beautifully furnished in Burmese style. Sitting in the open courtyard garden of the restaurant, drinking Myanmar beer with curry dishes is part of the enjoyment of the tour. After lunch we headed to the U Bein Bridge. This is a 1.2km long footbridge across the shallow Taungthaman Lake with lovely views of the surrounding area. Afterwards we visited Bagaya Kyaung for the 500 hundred or more Buddha images & 5000 sets of palm leaf manuscripts stored in a locked up library. This is now more of a museum than a monastery. Our last day in Mandalay was another memorable trip by boat to Mingun. 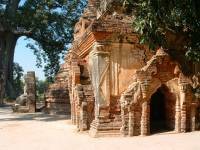 This is another ancient city near Mandalay. The hour-long private boat trip up river with view of river life is most pleasurable. 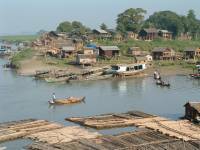 The boatman offers free tea & peanuts or a large bottle of Myanmar beer for a dollar. A slight blow of wind in the morning sun on the up river journey is considered to be cold by my guide & local people. I had to tell them what is the weather like in UK in the month of January. Mingun Paya is what everybody comes to see. A huge brick structure built as the base for the largest stupa in the world. The work stopped in 1819 when King Bodawpaya died. An earthquake in 1838 also damaged the monument. To appreciate the scale of this monument you have to climb 170 steps to the top to see a magnificent view of the whole surrounding area, the river, even a glimpse of Mandalay in the distance. Imagine the view if the stupa had been finished as planned. A pair of enormous mystical lions guarding the entrance from the river to the Stupa were also half-destroyed by the earthquake: now only the back end of each lion remains. It would have been a wonderful sight. We also visited the Pondaw Paya, Hsinbyume Paya, Settawya Paya & the Mingun Bell. The Mingun Bell is claimed to be the largest in the world which can be rung. My guide told me to thump the bell but must hit the ground first with the large wooden stick before hit the bell. It is to do with bringing the harmony of heaven & earth together. Most of other tourists just hit the bell. In Mingun it's the cow cart instead of horse cart for a slow ride around the area. They are so slow that children jump in & out for a short free ride with the travellers. We returned to Mandalay by the same boat for our lunch at the 'A Little Bit of Mandalay' restaurant. Another beautiful restaurant decorated in Burmese local style with tables in the open courtyard. The fish curry with tomatoes is the best I have had anywhere in my memory. It was spicy but not hot too handle because of the tomatoes. The fish fillet was beautifully cooked in spicy curry sauce. This goes even better washed down with Myanmar beer. Wonderful! It was time for us to travel back to the airport for our flight to Yangon. On the way to the airport we also visited a snake temple & Boleik village. Thanks to our excellent guide, Mr. Kyaw, who recommend this to us. The snake temple has two large Boas permanently resting on the Buddha image. The Boleik village was also fascinating with about 350 pagodas in various sizes & styles grouped together in the village area. Most of these pagodas are old, damaged & unused but it creates a forgotten wonderland hidden by the Shagn people. Finally we left Mandalay with a sense of reluctance & happiness. I always like the name Mandalay but I never thought I would fall in love with this majestic city of spirit & natural beauties beyond as a tour traveller. I love Mandalay. Please come & experience it all yourself.